The wine world thrives on novelty: new vintages, new flavours, new producers. In some ways, this is both understandable and necessary. Creating a bit of sizzle around a category that, in the UK at least, is struggling against a combination of high taxes, impoverished and mostly uninterested consumers and an increasingly strident health lobby is no bad thing. And yet sometimes it all feels a little too breathless. For as long as I can remember, the search has been on for “the next Australia”, a country that will do for wine sales what a combination of sunshine in a glass, Crocodile Dundee and the formidable Hazel Murphy did for the land Down Under in the late 1980s. Is it Argentina? South Africa? China? Turkey perhaps? There’s nothing wrong with what the art historian Robert Hughes once dubbed “the shock of the new” as long as it doesn’t get in the way of the reassurance of the old. I don’t want to sound like a Daily Telegraph leader writer, but there’s a lot to be said for tradition, and not only in wine. This thought struck me on a recent visit to Alsace, a region that I (and I suspect many of you) had largely forgotten. When I first started writing about wine, around the time that Crocodile Dundee was wrestling with alligators, it was often said that Alsatian wines were what the trade drank at home: our secret tipple, if you like. But that’s not true any more. When did you last open a bottle from this most beautiful of French regions? Why should the Alsatians worry? Three quarters of the 160 million bottles they produce each year are drunk locally, either by themselves or the tourists who come to the region to eat well and experience the painterly beauty of its landscapes. And yet these wines deserve a much broader audience. Alsace has a number of things in its favour. The first is that its wines are comparatively inexpensive, given their quality. The prices of the very top wines, Trimbach Clos Sainte Huhne, Zind-Humbrecht Rangen Riesling or Domaine Weinbach Altenbourg Gewurztraminer Vendanges Tardives – aren’t cheap, but we are talking some of the great white wines of the world here. Put them alongside the best of Burgundy and they are almost bargains. And below that lofty summit, there are hundreds of affordable Alsace wines. The second thing that makes Alsace well suited to the modern wine world is varietal labelling. Consumers don’t always know that Chablis is made from Chardonnay and Sancerre from Sauvignon Blanc, and the French generally couldn’t care less, but in Alsace the name of the grape is nearly always displayed. Alsace is one of the few appellation areas to do this. More to the point, there are only seven permitted grapes, many of which are familiar names: Pinot Gris, Riesling, Gewurztaminer, Pinot Blanc, Pinot Noir, Sylvaner and Muscat. The character of each varies, depending on the soil type on which it is produced, but they are still easy to understand. Compared with Burgundy, with its bewildering array of vineyard names and appellations, the region’s structure is simple, too: the wine is either still (AOC Alsace or one of 51 named Grands Crus, such as Brand, Schlossberg and Rangen), sparkling (Crémant d’Alsace) or sweet (Vendanges Tardives or botrytis-affected Sélections des Grains Nobles). Talking of sweetness, this is the only real source of confusion in Alsace. Many of the “dry” wines can contain as much as 30 grams per litre of residual sugar, with no indication on the label that the wine is medium sweet. Even if you accept that it’s all about balance – a wine with 7 grams grown on granite tastes much softer than one grown on limestone – you never know how sweet a wine is going to be. Or perhaps you do. Pierre Gassmann of the distinguished Rolly Gassmann estate in Rorschwihr, says that sweetness levels are often a matter of faith. Protestant families make dry styles, whereas Catholic ones favour sweeter ones. “The Protestant houses like Riesling because it’s more upright, whereas we Catholics prefer botrytis and headier wines.” Does this explain why Kreydenweiss, Hugel, Schlumberger and Trimbach all make great Rieslings? It’s an interesting thought. The other thing that hampers sales of Alsace wines, at least in the UK, is the fact that many people think they are German. It’s partly the names, but also the flute bottles. And yet they are very different in character from most German wines, even if one of the best Pinot producers in the Pfalz (Friedrich Becker) grows most of his grapes over the border in Alsace. Usually the term is misleading, but I believe that Alsace makes superb food wines, best appreciated at the table rather than the bar. Convincing people that this is so will take time, but it’s worth the effort. 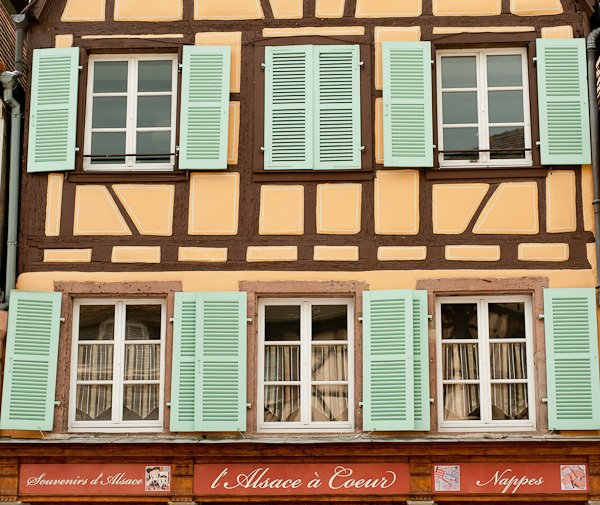 Alsace is France’s greatest secret, a region that makes nuanced, well balanced wines with a strong sense of place. Rediscovery, rather than novelty, should be the order of the day. Previous post: Should Bordeaux en primeur take a holiday?